There’s no escaping the fact that the loss of someone close to us is a difficult time for us. The impact, even if the life lived was long and fulfilling, can be overwhelming. 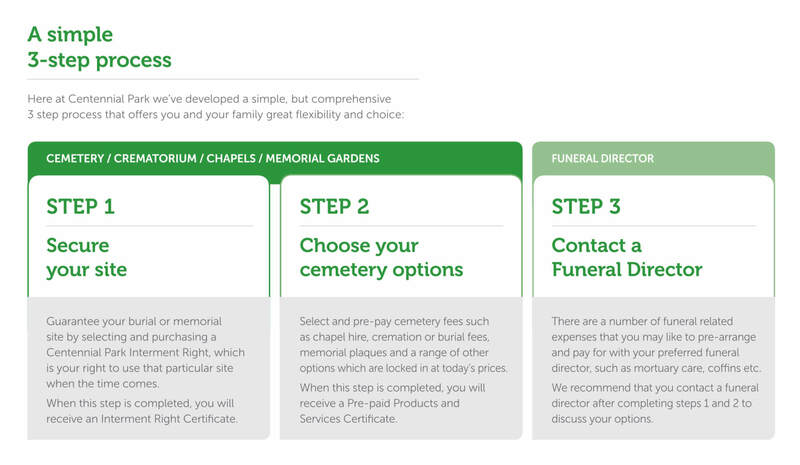 By planning and paying for your cemetery arrangements in advance, you give your family during a time of grieving, the comfort of having some of the many decisions they have to make, dealt with already and some peace in knowing that they are fulfilling your final wishes. You’ll also give yourself peace of mind, knowing that your wishes have been clearly expressed and documented and therefore likely to be carried out. So you can get on with living well. Here at Centennial Park we’ve developed a simple, but comprehensive pre-paid solution that offers you and your family great flexibility and choice. Planning Ahead is available for chapel, burial and cremation services at Centennial Park. You can pay for any of these in advance, in today’s dollars at today’s prices, to take care of some of the decisions that need to be made at a difficult time for families. Although the driving motivation of pre-planned cemetery arrangements is always peace of mind—particularly for your family— there also may be financial benefits. By pre-paying now you pay today’s prices and avoid future price rises. Any money you pay towards a burial or memorial position, ancillary cemetery services or costs, or a funeral director’s services, may be exempt from asset and means testing for social welfare purposes, such as pension calculations. We understand that this can be a difficult topic for people to address. Something that feels right today, may not—for any number of reasons—feel right tomorrow. So, if after purchasing and receiving your Pre-paid Products and Services Certificate from Centennial Park, you change your mind, we will refund your money. We include a five-business-day cooling off period from receipt of Pre-paid Products and Services Certificates, and if you request a refund within that period you will be refunded in full. If it’s outside the cooling off period there will be a small administration fee. You will also be able to request a refund of your Interment Right as guided by state legislation. We recommend that you ask your funeral director about the refundability/transferability of any products that you wish to pre-pay with them before entering into any agreement. Click Here to download our Planning Ahead brochure. Our team can assist you step by step with you pre-planning options. Please fill out your details below and one of our team members consultants will contact.